When I told you guys about our wine tasting at Scribe Winery in Napa, I mentioned the picnic they served us along with our wines but I didn’t go into detail. It seemed that each dish they brought out got better and better, although whether it was truly amazing food or the aura of being on vacation in wine country is still up for debate! I’d argue the latter, however, because I don’t know that I’ve ever had such fresh-tasting produce (grown onsite) or inventive flavor combinations. One of our favorites were some fried chickpeas—slightly crispy, with a smoky profile that the chef insisted wasn’t bacon, despite our convictions. I was determined to make them when I arrived home and managed to walk away with a rough list of ingredients that had been used in the ones at Scribe. My recreation isn’t perfect, but it’s close enough to satisfy. Like the Scribe chickpeas, mine are slightly crispy and one taste-tester actually asked if they contained bacon, which, for the record, they did not! Having made them twice now, they’ve never lasted more than a few hours, so I can’t talk to how well they’d keep but you’re best off eating them immediately anyway! They make a great snack or appetizer, but they’d also be a unique salad topper…skip the bacon and give these a try! 1. Drain chickpeas and rinse. Dry well with paper towels and set aside. 2. Heat 1 tbsp olive oil in a large skillet over medium high heat. Add diced shallots and cook until soft. 3. In a small bowl combine the flour with 1 tbsp thyme and zest from the lemon. Add the chickpeas and toss until coated well. 4. With the shallots still in the pan, add remaining 3 tbsp of oil to the pan. 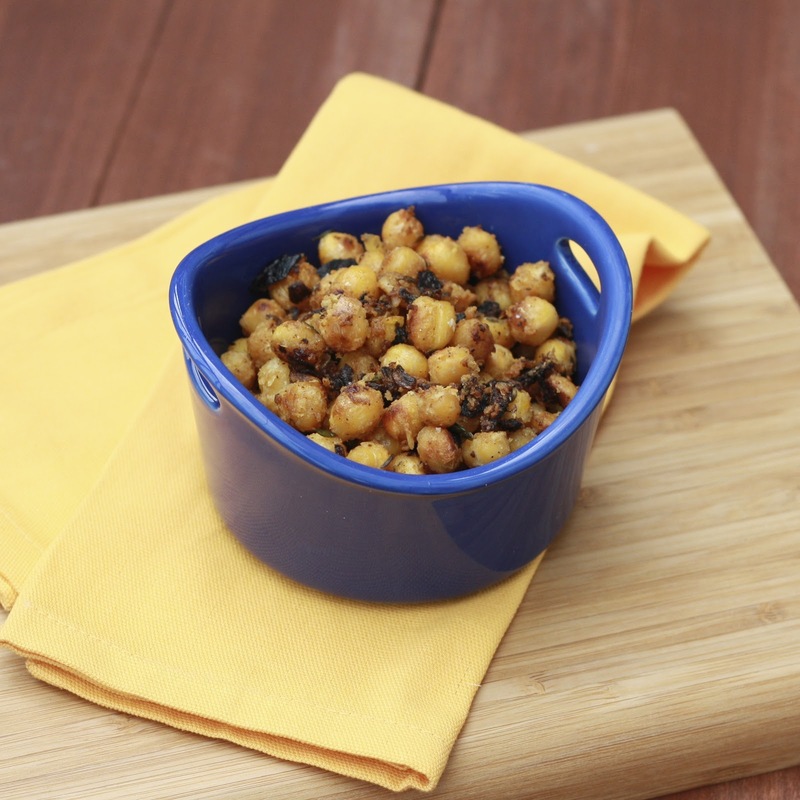 Add the coated chickpeas and sprinkle with additional 1 tsp thyme, salt, and chili powder. Allow to fry, tossing occasionally, for 10 minutes, until browned and shallots are crispy and pan is nearly dry. Remove from heat and squeeze juice from one half of the lemon over. Taste and season with additional salt and chili powder if desired. Allow to cool slightly before serving.